A reliable recording solution is a critical component of your customer experience platform for ensuring compliance with regulations and required procedures. It also helps you continuously improve employee performance and customer experience through quality management and interaction analytics. Yet, recording systems that aren’t natively integrated into the contact center platform (“third-party” recording) often create challenges resulting from lack of integration, as well as a high total cost of ownership. 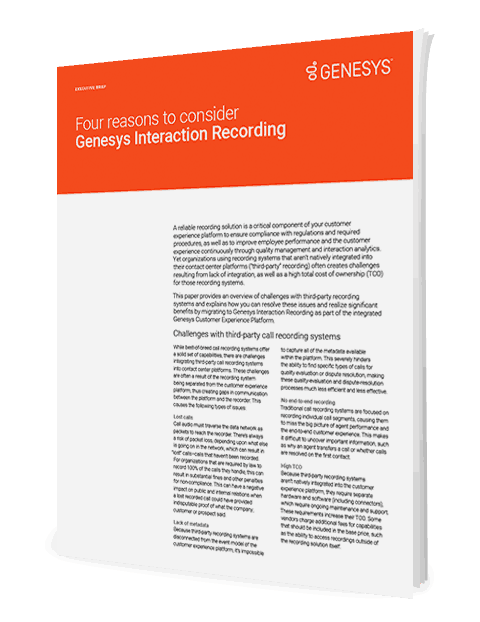 This Executive Brief provides an overview of challenges with third-party recording systems and explains how you can resolve these issues and realize significant benefits by migrating to Genesys Interaction Recording as part of the integrated Genesys Customer Experience Platform.